and decided to ink up my new Ellen Hutson Mondo Hydrangea stamp set. white cardstock and stamping them in berry sorbet ink. heat embossed them in clear. The sentiment is also from Mondo Hydrangea. my Reverse Confetti Basket Confetti Cuts, but I decided it was too shiny. So I pressed it into versafine onyx black ink and heat embossed it in clear. Wow, I love seeing this stamp without its stem, I think I like it better that way! Once again, another gorgeous card! I love the way you've used this stamp. The detail you've added with all the extra shine is phenomenal! Just lovely! Thanks for joining us at The Challenge! 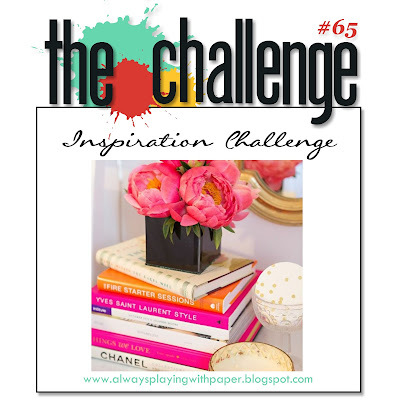 LOVE how you placed the hydrangea in that beautiful pot, WOW!!! Thanks for playing along with us at The Challenge! Oh so striking & beautiful, Leigh! Oh wow!! I love the beautiful hydrangea you used. Great take on the challenge!! Leigh, I LOVE this!! Thanks for sharing! Beautiful card Leigh. Love this flower and the soft colours. Just gorgeous Leigh! I love the embossing! This is gorgeous, Leigh. I am waiting for a few things to return to stock, before placing a big EH order including this gorgeous stamp. I hope you had a wonderful Easter. Beautiful. Thanks for telling how you made your card. Absolutely gorgeous, Leigh! What a bold, beautiful image! Thanks so much for playing along with us this week at The Challenge! You nailed the inpsiration photo Leigh! That thin pop of orange is terrific! So pretty and really looks like the inspiration photo.